Extreme Sailing Series video published Dec 2, 2018: Watch the video to find out more about the Swiss kings of foiling. Extreme Sailing Series video above scheduled for Dec 2, 2018. Extreme Sailing Series video above scheduled for Dec 1, 2018. See the other Extreme Sailing Series Los Cabos videos here. Get ready for a furious fight as the teams take each other down in the grand finale - #extremesailing Los Cabos, presented by Element Sports Group. LIVE Tracker #RORCTransatlanticRace UPDATE Dec 11, 2018: Kuka 3 wins the RORC Transatlantic Race Trophy--Franco Niggeler was presented with the RORC Transatlantic Race Trophy by Grenadian Minister for Tourism & Civil Aviation, Dr. Clarice Modeste-Curwen, M.P. at a ceremony held at Camper & Nicholsons Port Louis Marina, Grenada--while several yachts are still racing, none of them can beat the time set by Kuka 3 after IRC time correction. Kuka 3 finished the race 06 Dec 2018 for an apparent 1st in IRC overall. 2018 RORC Transatlantic Race Kuka 3 finish video above. Franco Niggeler's Swiss Cookson 50 Kuka3, skippered by Chuny Bermudez, overcame technical issues and a fire on board to post the best IRC corrected time, so far in the RORC Transatlantic Race. After over 12 days of racing in the Atlantic Ocean, the crew looked tired but elated to arribe at Camper and Nicholsons PortLouis Marina. Kuka3 RORC Transatlantic Race on Thursday 06 December, 2018 at 17:34:35 UTC in an elapsed time of 12 days 5 hrs 34 mins and 35 secs. Kuka3 was the second yacht racing under IRC to finish the race, after Pier Luigi Loro Piana's Supermaxi My Song. Kuka3 has set the best time after IRC correction and is in a very strong position to win the race overall and lift the RORC Transatlantic Race Trophy. with a basket of Grenadian goods, including chocolate, local spices and condiments. After 12 days of freeze dried cuisine the warm welcome was very much appreciated! RORC Race Officer Steve Cole was on hand to congratulate Kuka3 for finishing the race. 04 Dec 2018: Supermaxi My Song finished at 04 Dec 2018 17:47 UTC, 1st in Line Honours Monohull, setting new monohull race record. 01 Dec 2018: Multihull Line Honours for Maserati Multi 70 - PowerPlay close behind:on 1 December 2018 at 06:54:34 UTC, Giovanni Soldini's Italian Multi 70 Maserati was the first to cross the line in Grenada, taking multihull line honours to finish the 5th edition of the RORC Transatlantic Race. 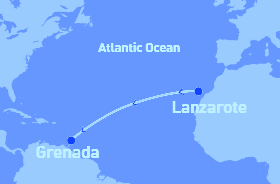 The team completed the 3,000 mile race between Lanzarote and Grenada in an elapsed time of 6 days, 18 hours, 54 minutes and 34 seconds. 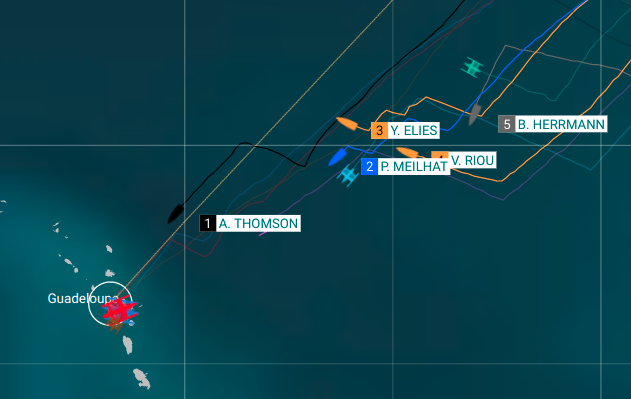 They were closely followed by Peter Cunningham's MOD70 PowerPlay, who crossed the finish line off Port Louis at 07:40:12, after an Atlantic duel between the two mighty trimarans. Video above published Nov 29, 2018. See also 2018 RORC Transatlantic Race Weather Predictions for the start (video) and 2018 RORC Transatlantic Race Preparation video. 5 Acts, 13 Teams, 26 Sailors. The 2018 Flying Phantom Series wrap-up video. Extreme Sailing Series video published Sep 6, 2018. Royal Yachting Association (RYA) video published Oct 25, 2018: "Stuck up the mast in the middle of the Southern Ocean" - Sailing Legend Dee Caffari. IMOCA 60 leader Briton Alex Thomson got to within 10 miles of Guadeloupe island and went to sleep. His electric probe wake-up watch either didn't fire or he slept through it so he woke up, in a flash, when he hit the rocks. To save his multi-million Euro yacht he started the moter, got off the bricks without too much damage and finished the race.On passing the line the Jury boarded his boat, interviewed him and as a result of starting the motor, they penalized him 24 hours on his elapsed time, which resulted in Thomson finishing 3rd in the IMOCA class. He admitted his mistake widely. 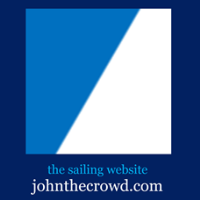 An unfortunate incident in his sailing career.--World on Water video above published Nov 17, 2018. Route du Rhum - Destination Guadeloupe video above published Nov 16, 2018: From start to finish, join Alex Thomson on the highs and the lows of the Route du Rhum-Destination Guadeloupe. RC44 Class Association video above published Nov 18, 2018. RC44 Class Association video above published Nov 18, 2018: After day one here in Cascais, Nico Poons' Charisma was dead last having posted a 7-8. Even newcomer to the fleet, Paulo Mirpuri and his Mirpuri Foundation, enjoying his first ever day racing in the RC44 fleet, were ahead. A 2-2-6-1 on day two saw the Monaco-based Dutchman's team fight back to fourth place, still nine points from the lead. Yesterday, a welcome continuation of their winning streak saw them win both races in big winds and giant seas, coinciding with a most unfortunate day for day two's leader, Team Nika. This propelled Charisma into the lead. No racing on the final day left Charisma hitting the jackpot, winning the RC44 Cascais Cup, with a three point advantage over Chris Bake's Team Aqua, second on countback to Igor Lah's Team CEEREF. Charisma also overhauled both Team Nika and Team CEEREF to claim the annual RC44 Championship for the first time. The RC44 Cascais Cup is the final event of the 2018 RC44 Championship Tour which pits the world's top businessmen and the best sailors in the industry compete in high-performance one-design 44-foot carbon racing yachts. RC44 Class Association video above published Nov 17, 2018: The dramatically different conditions on day three of the RC44 Cascais Cup saw some teams come to the fore today, perhaps better suited to the severe conditions, none more so than Nico Poons' Charisma. The Monaco-based Dutchman had won yesterday's final race and continued his winning streak today to claim bullets in both of the two races held. In comparison yesterday's runaway leader, Vladimir Prosikhin's Team Nika, had a day they'd rather forget, posting a disappointing 6-8, the latter following some leeward gate spinnaker trawling. The end result going into the final day of the RC44 Cascais Cup, and of the 2018 season, is that Charisma has streaked into the lead, three points ahead of Chris Bake's Team Aqua. See also Day 2 Video RC44 Cascais Cup 2018 - Four races, four different winners. The RC44 Cascais Cup is the final event of the 2018 RC44 Championship Tour which pits the world's top businessmen and the best sailors in the industry compete in high-performance one-design 44-foot carbon racing yachts. RC44 Class Association video above published Nov 16, 2018: Beautiful drone shots from day two in Cascais from our team at Icarus Sports shows just how close the racing is for the teams competing in the RC44 final. Alex Thomson Racing video above published Nov 13, 2018: Follow Alex Thomson at https://www.alexthomsonracing.com/rdr-tracker/. Route du Rhum - Destination Guadeloupe video above published Nov 13, 2018: Time for the tropics -- As the skippers cross the tropic of cancer, there are plenty of feel good vibes despite lack of sleep and a big battle playing out on the water. See also the other video updates here. The route of the 2018 Route du Rhum - Destination Guadeloupe video--route of the 11th Route du Rhum - Destination Guadeloupe, the legendary transatlantic race from Saint Malo to Pointe à Pitre, which celebrates its 40th anniversary in 2018!--1 single start, one line, 4 Nov 2018 at 14h--6 Classes, 6 start sections, 6 different ETAs, 6 winners!--The same course for all, 3542 nautical miles! See also image of the day video (in French); focus on the world's fastest monohulls IMOCA class; and Route du Rhum - Destination Guadeloupe 2018: 40 Years of Legend video. Features: solo; 3510 nautical miles; OSR Category 1. Watch LIVE Sailing - Hempel World Cup Series Genoa - Watch live Medal Races from the 49er, 49erFX and Nacra 17 at Hempel World Cup Series Genoa.